Two suicide bombers detonated a car packed with explosives in Yemen’s southern city of Aden on Tuesday, killing at least six people, witnesses said. According to Reuters, dozens of other people, including civilians, were wounded in the attack. 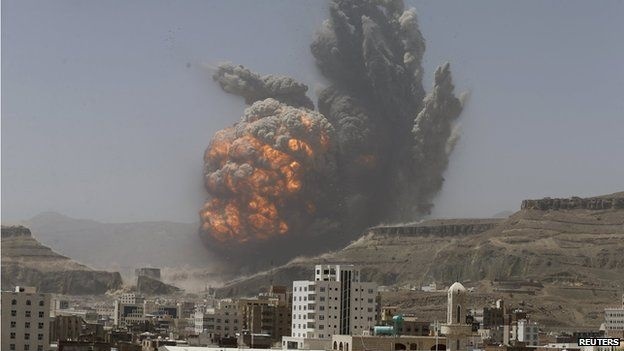 The bomb exploded outside a camp used by a local security force organised by the Saudi-led coalition fighting Yemen’s Houthi rebels. Witnesses described a huge explosion that shook the al-Mansoura district in northern Aden, destroying at least one building and shattering windows in others. Ambulances rushed to the scene to evacuate the wounded. Pictures circulating on social media showed several young men in military uniform being carried away. No one has claimed responsibility for the attack, which comes as a civil war between the Iran-aligned Houthis and the internationally recognised government of President Abd-Rabbu Mansour Hadi drags on with no sign that it will end soon. Islamist militants have exploited the fighting to try to recruit more followers and expand their influence in the country, which sits near main shipping lanes. The camp attacked on Tuesday was occupied by a local force called the Security Belt, in al-Mansoura. The Security Belt was set up by the United Arab Emirates to help restore security to the port city, the temporary capital of Hadi’s government, after the Saudi-led coalition helped local fighters drive the Houthis out of Aden in 2015.